Tsitsikamma National Park, Eastern Cape, South Africa is located in the top section of the magnificent Garden Route National Park with exceptional marine and land based attractions. This wonderful Garden Route attraction is situated just north of Plettenberg Bay. The Tsitsikamma National Park, Garden Route, South Africa, includes the scenic Storms River mouth, a craggy coastline, ancient forest and a number of cultural sites which are now being developed. Tsitsikamma National Park, Garden Route, South Africa is home to a variety of wildlife including the very rare African Black Oystercatcher, the country’s most endangered bird species as well as the smallest antelope in South Africa, the Blue Duiker which is also endangered. This beautiful stretch of coastline is a national treasure and incorporates the Tsitsikamma, Knysna Lake Area and Wilderness. The mosaic of eco-systems from the ocean to the mountains incorporates pristine beaches, rugged cliffs, Cape indigenous forest, Fynbos, rivers and lakes to create one of the most sought after attractions in South Africa. The weather along the Garden Route in South Africais generally nice and temperate. The very wet months are May and October. The driest are the winter months from June to July. Tsitsikamma National Park is situated some 615kms (382 miles) from Cape Town, 195kms (121 miles) from Port Elizabeth and 68kms (42 miles) from Plettenberg Bay. The access route from the N2 highway and all internal roads are tarred. Car hire can be collected in Plettenberg Bay. The nearest airport for scheduled flights is George, while private aircraft can use the Plettenberg Bay airport. 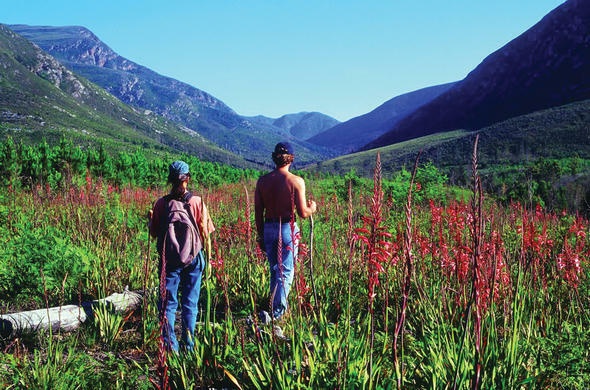 Tsitsikamma National Park is blessed with glorious beaches, fragile Fynbos and the evergreen coastal forest. The Park stretches for about 80 km (almost 50 miles) from the lagoon at Nature's Valley in the west to the mouth of the Groot River in the east.